This bicycle tour takes you well off Cambodia's beaten path, away from the temples and into the heart of natural wonders such as mangrove forests, secluded beaches, waterfalls, rivers and the rainforest of the Cardamom Mountains. Using boats to go deep into forests we'll explore small villages and even ancient burial sites containing cultural artifacts. From Cambodia's capital of Phnom Penh, we ride to the Gulf of Thailand and the former resort town of Kep and cycle along the coastline through quaint fishing villages. After a day at the beach, we head north to the Cardamom Mountains and overnight at a Community Based Eco-Tourism (CBET) project that is offering locals an alternative living to logging and hunting. 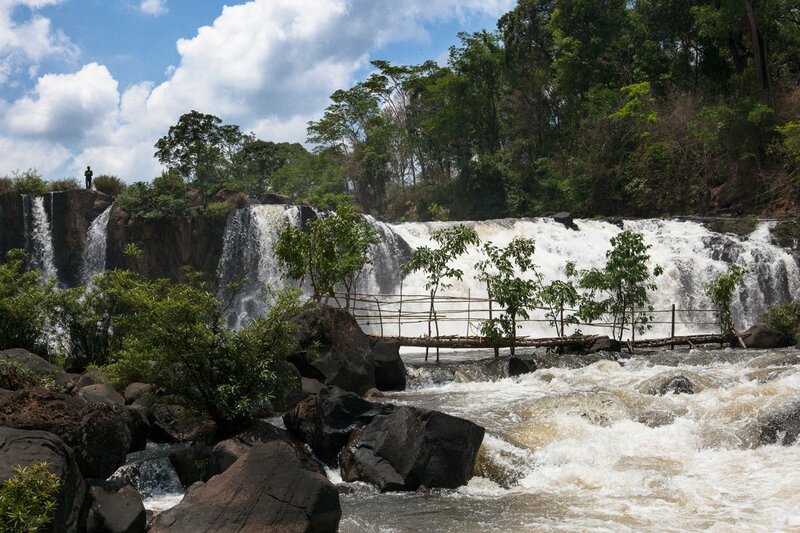 Here we ride on single track trails before cycling further north and an eco-lodge that also boasts the nearby Tatai waterfall. We leave Cambodia and ride into Thailand where we'll ride along the quiet coastline of the Kingdom and visit a few Eco-based communities. From Phnom Penh, we drive to visit the notorious Killing Fields before moving on to Banteay Meas. Here we begin riding on quiet country roads to Kep. Cycling from the hotel, we visit a cave temple and then roll through fishing villages to Kampot. After lunch, the ride takes us to Ream National Park. We start with a short and easy ride through the jungle on ox-cart trails to a pier for a boat trip back to the beach. In the afternoon, we transfer to Chi Phat. Leaving Chi Phat, we ride off-road through rivers and over fallen logs on trails varying from soft and sandy to wet and muddy, and along the way stop at waterfalls to cool off. We ride to Trapeang Rung on a slightly undulating tarmac road, flanked by lush vegetation and lunch en route to Tatai Waterfall. Then we boat along the Kep River to spend the night near the edge of the Cardamom Mountains. You are free to explore the river by kayak, go for a hike, or enjoy a boat trip to the waterfalls. We ride to the town of Koh Kong that shares a border with Thailand and say goodbye to our Cambodian crew. We'll be met by our Thai guides who will take us for some eco-friendly activities in the mangroves. We will then ride a little bit to explore some more before finally reaching our hotel for the night. We start our day by riding to an eco-tourism-based community, known for making special hats made from palm leaves. From there, we ride for about 35 km before we load up the bikes in our transfer and head over a hotel in Chanthaburi. Today we make our final ride as pedal our way to the outskirts of Rayong. We will ride to Hat Mae Phim where we will have a deliciously epic seafood lunch. We will look back on our journey, share stories and say our goodbyes before being transferred to your Bangkok hotel or the airport. Sokhom was an amazing tour guide. He was able to explain Cambodian history and tradition and make us laugh a great deal. He was always receptive to our needs and requests. I would highly recommend requesting Sokhom! A good balanced mix of cycling on backroads and single track combined with heritage sites and cultural insights, led by a highly competent team of Sokhom (guide) and Mr Kheng and Mr Lee (drivers) in Cambodia, and Woody and Mr Pong in Thailand. I really enjoyed the trip. The guide Mr. Suan Sokhom was great company and a perfect guide. We ride 367 km on a mixture of tarmac roads in reasonable repair, vehicle width dirt trails, and some single track. Most of the rides are on flat terrain, with a few rolling hills towards the end of the tour, and on quiet back roads. We try to avoid the highways where possible. Suitability: This trip has been designed to be easy with flat riding, but there are variations in the surfaces. This trip can be done by anyone of a reasonable fitness level. A support truck is always available to help when required, with the exception of Day 4. Biking Conditions: The roads are a mixture of tarmac, broken tarmac, vehicle-width dirt roads, and single track trails. The distances aren't overly long and can be handled by those with basic fitness levels. Some off-road experience is suggested to enjoy the day riding in Chi Phat. Meet in Phnom Penh and be picked up from your hotel to transfer directly to Takeo Province. We stop for a sombre visit to the Killing Fields, an extermination camp for political prisoners during the terror reign of the Khmer Rouge. The remains of 8,985 people were exhumed from mass graves and are kept in a memorial here. We drive on to Banteay Meas, where we have a picnic lunch before we start our 48-km cycle on quiet country roads to Kep, Cambodia’s prestigious beach resort of the 1960s that is reawakening to its former glory. The cycling is flat and on tarmac roads, so we'll quickly find ourselves at Kep, riding past villas that have fallen on hard times since their heyday. We have a wonderful view of the bay and outlying Rabbit Island from our eco lodge. We cycle directly from the hotel, riding to Phnom Chhngok to visit a temple built in a cave between the 7th and 8th centuries. It's just a short ride, through picturesque fishing villages, to Kampot, where we have lunch at a restaurant on the river. We beat the afternoon heat by transferring for just over an hour and then jumping back on the bikes to ride into Ream National Park. This park has mangrove forests and miles of secluded beaches. We then transfer to a lovely beach resort. After a seaside breakfast, we have an easy start as we ride to the trail head to start some trail riding. We ride through the jungle on ox-cart trails. There will be some sandy bits, so take it easy on the turns. It's a short ride of 12 km down to the house of a former Khmer Rouge commander and then to the pier where we meet our boat that takes us back to the beach. We'll see locals fishing on the edge of the mangroves as we relax after a fun ride. We have time to visit the beach before lunch. In the afternoon, we have a 3-hour transfer to our next overnight in Chi Phat, a community-based eco-tourism initiative. Once the centre of illegal logging and poaching, Chi Phat is now working to preserve the natural environs and giving the community an alternative form of income. Once reaching the Preak Piphot River, we cross by ferry to Chi Phat and check in to our homestay. If there's time, we'll go for a ride through the village before dinner. We have a great day of riding ahead of us today! We will be on dirt trails all day, as we explore where nomadic indigenous tribes once roamed the jungle and visit one of their sacred burial sites wedged into a cliff face. The cycling will be through rivers and over fallen logs, with the trail varying from soft and sandy to wet and muddy – the perfect playground for any biking enthusiast of any level. We stop at waterfalls to cool off. We won't have a support vehicle today, but we will carry extra water and lunch. When we're back in the village, we have a group dinner provided by the local community made from fresh local ingredients, and then it's time to retire to your simple, but clean bed for the night. After waking to the village sounds, there is the option to give back to the community by planting a tree. We then cross back over the river and transfer to Trapeang Rung, the start of today's hilly ride. We cycle on a tarmac road that undulates and is flanked on either side by the Cardamom rainforest. The hills will be a big change after all the flat riding we have done. We stop for a picnic lunch en route to Tatai Waterfall, the end of our riding for the day. Here we grab our swim suits and spend some cooling off time at the waterfall. Once all feels normal again, we take a boat directly from the waterfall up the Kep River to our eco lodge. Here you can go for another swim in the tidal river, go for a kayak ride, take a short hike, or just relax. Today is free for exploring the river by kayak, going on a hike organised by the lodge, or meandering on a boat trip to the waterfalls. The other option is to relax by the river and let life slow down. After waking to the sounds of the jungle coming to life we have a relaxing breakfast before taking a short boat transfer to our waiting bikes. We have a fairly long journey ahead of us today. We ride on a gently undulating tarmac road before descending to the plain. We ride on to the border town of Koh Khong where there's one last hill before we see Thailand. Here we say goodbye to our Cambodian crew and be met by our Thai guides. We will transfer by van to Ban Tha Ranae, a mangrove conservation forest, where we will learn about the Eco-tourism project that the locals are involved in. You will be able to take part in restoration activities such as planting of palm tree saplings. We will have lunch here. If there is time, we might ride south to the pier before heading to the hotel and have our dinner. The hotel is quite unique as it is located within a mangrove forest and boasts both scenic lake and sea views. After a good breakfast, we start our journey towards Chanthaburi province. First, we ride to Ban Nam Chiao, a community village steeped in Eco-tourism projects. The community is famous for making multi-purpose hats, called Ngop Nam Chiao, which are made from atap palm leaves. Can you see where the community gets their name from? Here we also observe how the Muslims and Buddhists live in harmony and learn about the wisdom they have attained over generations. From the village, we ride towards the coast and then swing back up north through undulating hills, surrounded by lush vegetation and forest areas. There are a couple of steep, challenging climbs but nothing too difficult. It will be a fun ride for about 10 kilometers before we reach a relatively flat road. We ride for about 35 km till we reach the highway where we transfer all the way to our beachside hotel in Chanthaburi. If we have time, we may ride to a Buddhist temple nearby before having our dinner. Today we make our final ride as we pedal our way to the outskirts of Rayong. We will cycle to Hat Mae Phim where we will have a delicious seafood lunch. Along the way, you will encounter the coast, lush vegetations, rice paddies, small towns and quaint villages. At lunch, we will look back on our journey, share stories and say our goodbyes before being transferred to your Bangkok hotel or the airport. The bikes you will be riding are well-known makes of mountain bikes with lightweight alloy frames, 24- to 27-speed gearing, v-brakes, and Shimano components and front suspension.